Johannesburg-born, Thoba is largely self-taught, although he undertook some training at the Johannesburg Art Foundation and in Swaziland. 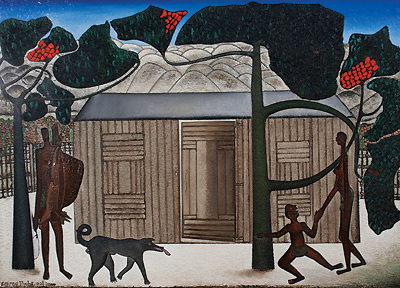 Thoba is known for his politically charged artworks - as he was a very active member of the resistance art movement. He is known for his famous work titled Thank you Mr FW de Klerk for handing over South Africa to Nelson Mandela. Thoba’s paintbrush not only condemned white-on-black violence, but also brought to light the effects of apartheid among blacks themselves. In post-apartheid South Africa, Thoba remained moved by the plight of the people in the black townships: not so much the violence, as the effects of urbanisation and westernisation on traditional values. Frequent subjects include children who have turned to stealing, prostitution and violence to survive on the streets. Human relationships and personal suffering also serve as inspiration, as do contemporary events, which Thoba draws from newspaper articles. "Humanity is central to my work, resulting in paintings charged with emotion."